In the past, the term “disruptive” conjured up images of the unruly kid sitting in the back of the class. While the rest of us were trying to learn about world history or geometry, the annoying tot behind us was plotting how best to get the teacher’s goat. That kind of disturbance was irritating and difficult to deal with for both students and the teacher, but it’s no match for the type of disruption with which today’s business leaders now have to contend. If you haven’t heard the word “disruption” recently, you may want confirm that you are in fact living on the planet Earth. To be sure, it’s an overused buzzword, but it carries with it a little more heft than “sea change,” “paradigm shift,” or even “heavy lifting.” Those terms don’t elicit much of a reaction in our bodies and minds. Your heart rate might go up a beat or two if you are the one getting the heavy-lifting assignment, but other than that, no one is experiencing a fight-or-flight response to those phrases. 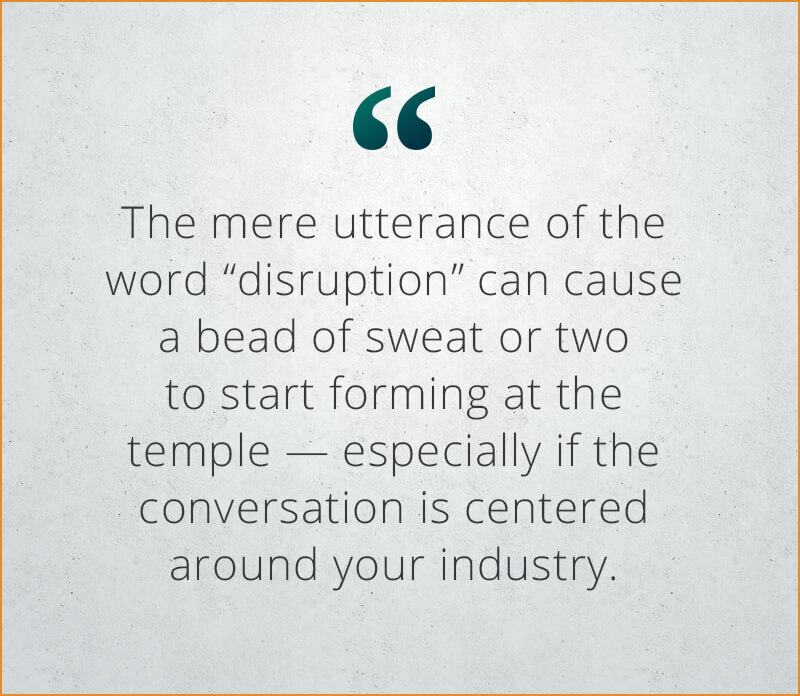 However, the mere utterance of the word disruption in the business world can cause a bead of sweat or two to start forming at leaders’ temples — especially if the conversation is centered around their industry. The term has grown in impact because, in many cases, a disruption can cause careers, investments, businesses, and even entire industries to be rendered obsolete. And it can happen faster than you can say “cheese” as someone is taking your picture with their smartphone camera. In today’s fast-paced world, it’s easy for a brand to get lost in the shuffle. Customers are bombarded with unsolicited emails and calls from companies guaranteeing they’ll solve all of their problems. That last thing you want is for your customer, in a moment of weakness, to fall prey to one of these solicitations and actually respond to them. In order to avoid this, you have to stay in front of your customer. Your brand needs to be top of mind. Now, you don’t want to flood them with communications on a daily basis — that will get you quickly unsubscribed — but you do want to give them regular, gentle reminders that you are there, you care, and you are providing value. There are many ways to stay in touch with customers, but it’s best to take a multifaceted approach. Send them emails, call them occasionally, send them a card or a small gift, ask them to fill out a short survey, or invite them to a webinar. Keep your brand in front of them from multiple angles. This will help to ensure your brand is positioned in a positive light in the mind of your clients, which in turn breeds brand loyalty. These initiatives require very little effort from your customer, yet they each involve interacting with your business. And each time they take an action related to your brand, their commitment level increases a notch. When a disruption occurs, it’s usually in the form of an easier or better way of accomplishing some task. Amazon is a good example of this. Through rethinking distribution, they’ve made it possible for buyers to order online and have items delivered the same day. Uber is another example. By using mobile technology and applying a ground-breaking business model to ride-sharing, they’ve made the experience of getting from point A to point B much more enjoyable. Although Amazon and Uber are quite different, what is similar about them is that they’ve found ways to make it easier for the customer to do business with them. There are some pretty simple ways to streamline how your customers interact with you. For example, make it easy for your clients to get answers to their questions. That may sound obvious, but how many times have you been routed to a company’s online help section only to spend valuable time unsuccessfully searching for your answer? If you’re going to offer online help, make it a stellar experience, or else let customers call in with questions. Take steps to actively show that you value their time. Online scheduling, which was mentioned in the prior section, is a simple way to allow customers to book appointments when it’s convenient for them. They’ll appreciate that you’re not forcing them to call in to make, change, or cancel appointments during your business hours (which often fall during the same time your customers are at work). Let’s face it: Disruption is a part of the world we live in, and it’s not going away. In fact, the rate and number of industries being disrupted will only increase in the future. But that doesn’t mean you have to cower in the corner every time you see or hear the word. There are numerous actions you can take to ensure your company stays strong even during a period of massive change. Try some of the suggestions noted above, and you’ll be well on your way to weathering even the most turbulent of business times.